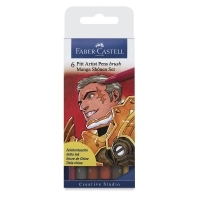 Pigmented India Ink in multiple nib sizes and 58 colors brings great versatility to pen-and-ink drawings requiring lots of intricate details. 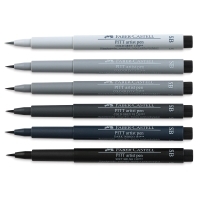 Pitt Artist Pens are great for sketching, journaling, cartooning, and drawing. 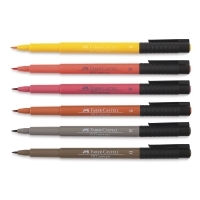 The Superfine, Fine, Medium, Bullet and Brush nibs not only replace ink bottles — they're instantly available for work. 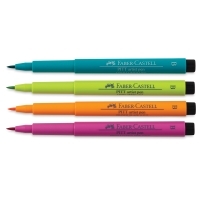 The ink is waterproof, unsurpassably lightfast, acid-free, and pH-neutral. 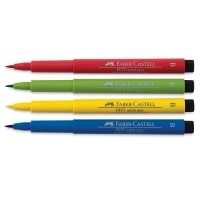 The nib size is prominently displayed on the end of the cap. 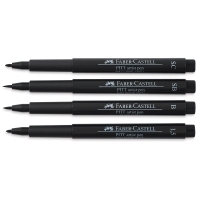 Black Illustration, Set of 4 — Includes one each of Soft Chisel, Soft Brush, 1.5 Bullet, and Brush Nib. 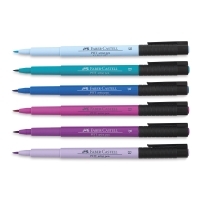 Sets of 4 Pens, Black — Sets of 4 include one pen in each of four sizes, Superfine, Fine, Medium and Brush. 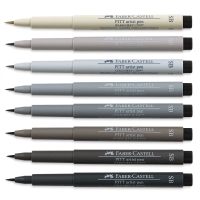 Available in Black, Sanquine, or Sepia. Wooden Gift Box, Set of 90 — The variety of colors and nib types in this elegant wood box set bring wonderful versatility to pen-and-ink drawings. 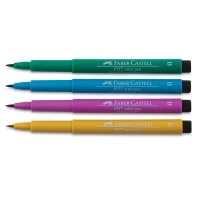 The set includes 90 pens in a range of 66 colors (including metallics) and a variety of nib types. 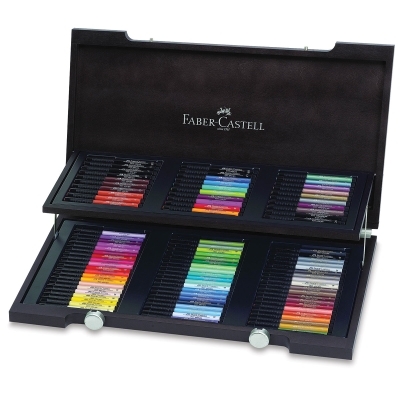 Gift Box Sets — Graphic artists, illustrators, designers, architects and art students will all appreciate a sensational box of 12, 24, or 48 Pitt Brush Pens in a full color spectrum. 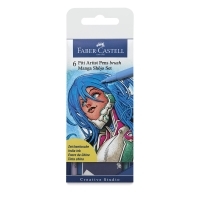 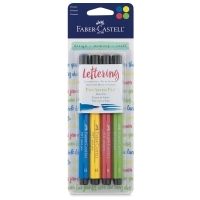 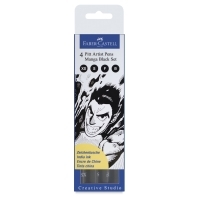 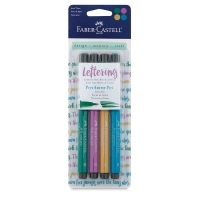 Each pen is filled with lightfast, waterproof India Ink and has a high-quality brush point for maximum flexibility on freehand or detailed sketches. Each set includes a beautiful faux leather gift box that doubles as a pen stand. 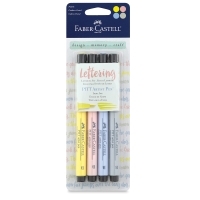 Black, Fineliner Set of 4 — Includes one Black pen in each of four sizes, including Extra Superfine, Superfine, Fine, and Medium. 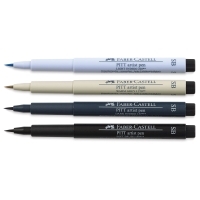 Wallet, Set of 8 — This set contains eight Pitt Artist Pens in Black, including one each Extra Superfine, Superfine, Fine, Medium, Brush, and three new nib varieties — Extrasoft Brush, Round-point Needle, and Wedge. 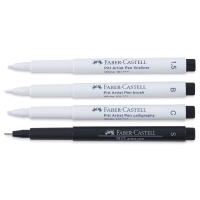 White and Black, Set of 4 — This set includes four pens, one each of White Brush, 1.5 mm White Bullet, White Chisel, and Black Superfine. 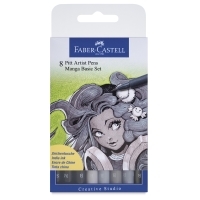 Pigmented India Ink in multiple nib sizes and 48 colors brings great versatility to pen-and-ink drawings requiring lots of intricate details. 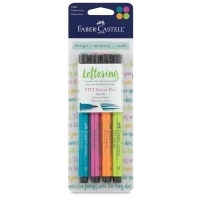 Pitt Artist Pens are great for sketching, journaling, cartooning, and drawing. 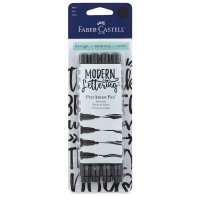 The Superfine, Fine, Medium, and Brush nibs not only replace ink bottles — they're instantly available for work. 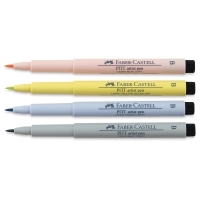 The ink is waterproof, unsurpassably lightfast, acid-free, and pH-neutral. 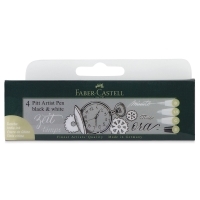 The nib size is prominently displayed on the end of the cap.